Cascadia Climate Action — CascadiaNow! Cascadia Climate Action facilitates public awareness, involvement, and engagement on climate change issues by providing easily accessible tools and information in support of efficient, effective climate action. Cascadia Climate Action promotes community engagement on climate change through a one-stop calendar of upcoming climate events, a website of information and resources, an email newsletter, and engaging science-based presentations and outreach activities. The potential number of individuals involved in and addressing climate change can be greatly expanded along with their effectiveness by replicating the Cascadia Climate Action (CCA) model. CCA envisions that the growth process will organically respond to human, technical and financial resources that become available and the growing urgency of climate action perceived by the community at large. Cascadia Climate Events Calendar (below): The CCA aggregating calendar of climate related events and actions will be maintained and publicized through Cascadia Climate Updates, events such as Climate Science on Tap, other community and organizational newsletters, social media and calendars, and advertising in community newspapers, on radio stations, and at venues, as funding and volunteer capacity allows. Cascadia Climate Updates (sign-up here): The CCA email newsletter, Climate Event Update, will be released to subscribers monthly, bi-monthly, or more frequently as warranted and capacity allows, with highlights of upcoming events to help subscribers stay connected with the variety of climate activities happening in the Cascadia region. Climate Outreach Events: CCA increases public awareness and engagement on climate change through bringing experts on energy and climate science out to friendly community venues. Climate Science on Tap: Panels and speakers are sponsored and coordinated for venues such as at brew pubs and cafes. Ask a Climate Scientist: This format makes climate scientists available at a booth or table at fundraisers, as well as at fairs, such as the Sustainable Ballard Festival, to demonstrate how greenhouse gases cause global warming and ocean acidification. Climate scientists also have the opportunity to answer questions that people may have about climate change. Climate Science/Energy Speakers: Groups, churches, schools, organizations, or community residences can request a speaker on a climate or energy topic that is of interest to their membership, such as Rotary Clubs, retirement residences, or student organizations. Climate and Coffee/Climate Science Cafe: This format provides experts with different perspectives on coffee production to speak at coffee shops in order to raise awareness of how the Arabica coffee bean is threatened by climate change. The presenters may be made available at a variety of coffee shops throughout the city as a way of raising awareness about climate change’s impact on an iconic part of NW life. These events also provide information to audiences on how they can get involved and take action through CCA. Climate Science Slams: In the format of a poetry slam, graduate students or post docs with expertise in climate topics of atmospheric science, oceanography, forestry, fisheries, and policy can compete with presentations on their specialty for votes from the audience, while at the same time both educating and getting experience in effectively communicating climate science. Climate Action MeetUps: See what's happening and join the Cascadia Climate Action MeetUp here! Meet, greet, and get into discussions of climate action and supporting the climate outreach work that CCA does! Beginning in 2014, leaders for what became Cascadia Climate Action were involved in climate outreach by coordinating a “Speakers Bureau” workgroup at the 350 Seattle monthly meeting. They were also involved with other non-profit groups targeting fossil fuel exports, power plants and climate policy action, including Citizens Climate Lobby and Sierra Club Washington Chapter’s Beyond Coal Taskforce. The need for a calendar of upcoming climate events became evident as these groups tried to avoid scheduling conflicts on events they sponsored. Mary Manous, founded Cascadia Climate Action to have an independent organization making this information available for use by all and started aggregating events into a one-stop calendar that was embedded into the new Cascadia Climate Action website. Shortly thereafter the Climate Event Updates email newsletter was made available to provide information about upcoming climate events to subscribers. scientists would give demos about global warming and ocean acidification, while fielding questions and giving prizes to kids and adults who could answer one of their questions. This grew into arranging for the scientists to give climate related presentations on their area of expertise at venues such at bookstores and cafes and then at brew pubs. These have been done in collaboration with Humanities Washington as part of their Think and Drink series at Naked City Brewery and Tap House, and in the past year, at two brew pubs in a format series called "Climate Science on Tap." Along the way, Cascadia Climate Action has supported other climate outreach and community engagement as opportunities or ideas inspire us. 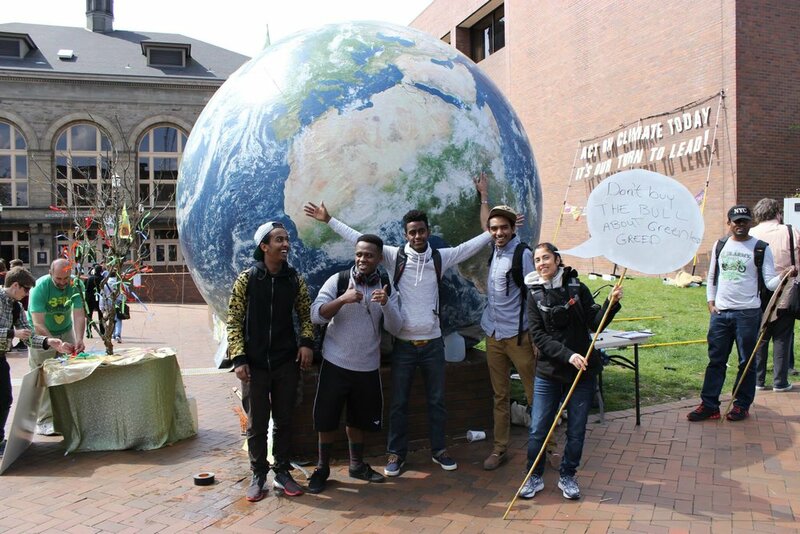 These include the 2015 Earth Day Climate Action Festival at Seattle Central College, supporting panels at Town Hall on clean energy and nuclear power, and providing speakers for college classes, church events, and arranging for visiting high school students from Bellingham to meet climate activists and attend events for a field trip.